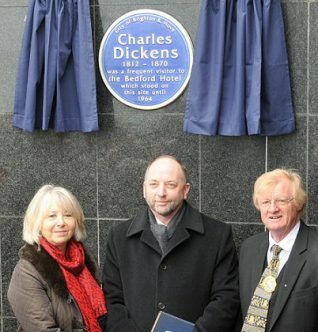 Ian Dickens, the great-great-grandson of Charles Dickens has unveiled a blue plaque on the Holiday Inn, formerly The Bedford Hotel, as part of the celebrations to mark the 200th anniversary of the famous author’s birth. The original Bedford Hotel had its own plaque installed in 1925 to honour Charles Dickens, but the hotel was destroyed by fire in 1964. The Bedford Hotel was designed by Thomas Cooper and opened in 1829. It was considered the most distinguished late-Georgian building in Brighton after the Royal Pavilion. It had five storeys with two recessed Ionic porticoes facing south and west above the entrances, while the west wing was built back from the road and was decorated with giant pilasters. Inside was a Grecian hall with Ionic columns and a glazed dome. Dickens was a frequent visitor to The Bedford Hotel and much of his novel ‘Dombey and Son’ was written there. In the novel, Paul Dombey is sent to Brighton to be educated at Doctor and Mrs Blimber’s school in Upper Rock Gardens. There are also references to Brighton in ‘Bleak House’, ‘Nicholas Nickelby’ and ‘Sketches by Boz’. In ‘Martin Chuzzlewitt’ Dickens describes an ale by the name of ‘The Brighton Tipper’. Click on the image below to open a large version in a new window. Click again to further enlarge. It was so lovely to see. Ian was clearly so proud of his great great grandfather. He even signed my Charles Dickens book for me afterwards. I find it absolutely astonishing that the ’60s monstrosity that sits on the site now was allowed to be built when you see the magnificence of the original building. What were the planners back then thinking of? 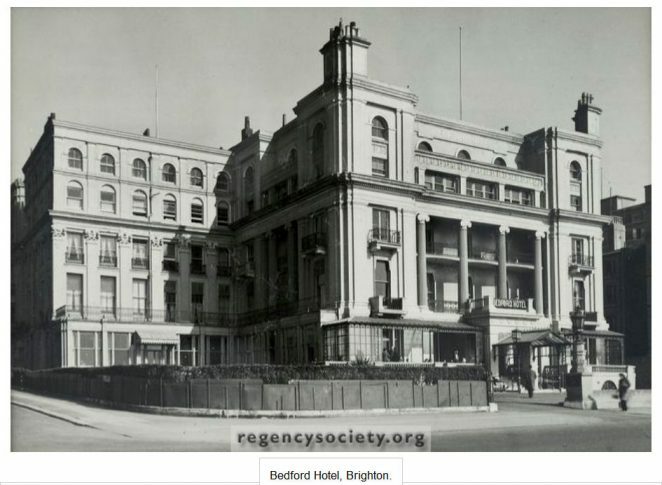 Correction for William Mansfield: The Bedford Hotel opened in October 1829, not 1835.